To celebrate our launch, we’re offering everybody a 10% discount this week! We have some awesome ideas for future board game themed collections and we can’t wait to get working on them and make them available later this year. Keep an eye out on our social media channels this coming week, we’re giving away some cool stuff. Which of our 160 comics is your favorite? Congratulations on 3 years and the merch store! I also like Clank! and I’m glad you made a couple of different comics featuring it! What’s this, merch? From an awesome board game webcomic? 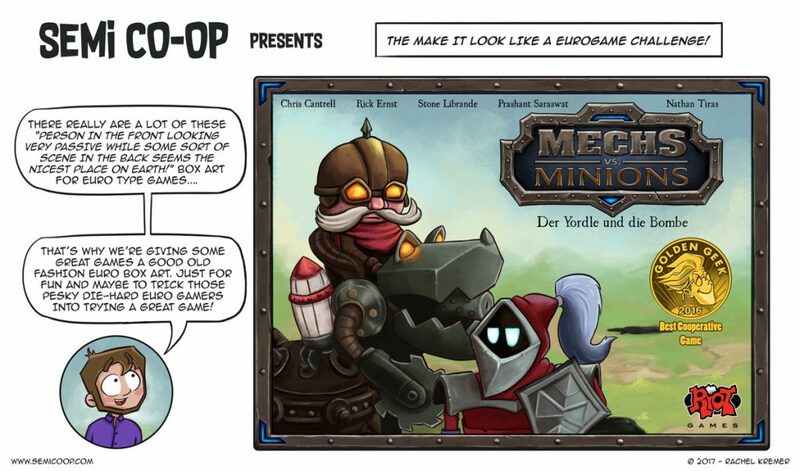 An awesome European board game webcomic, so I won’t have to pay loads to get it shipped to Europe? Android Netrunner is my very favourite game, and Arkham Horror LCG one of my other favourites, and we constantly use Netrunner terminology in it! Also, everything else that is Netrunner-related. When I saw that you had Netrunner comics, I knew I needed to read on. About the shop: I was going to get the green bag, but then I saw that it ships from the US and shipping is half as much as the item I want to buy, plus it’s over the VAT threshold. Man, why can’t we even get European merchandise when the creators are in Europe?! So utterly frustrating. Since you’re running this via an external service anyway, would you consider setting up a European shop as well? I know these “Print your own designs on stuff” services exist in the EU, because I’ve bought non-boardgame merchandise in them. The Netrunner terminology just sticks really well somehow. Even in 7th Continent, I call it installing a card! It’s ridiculous. 😉 Have you also played Netrunner: Terminal Directive? I fully understand your frustration with the overseas store, but with most of our readers being located in the USA – this was the most logical choice for us. We haven’t looked into EU alternatives yet because that means we have to promote two different store platforms. There will be a free shipping period on Threadless from 28th April – 5th May. For international orders, that means free shipping with for orders of $80+. That is a lot of money, but we what we do often is placing a combined Threadless order with friends. Oh yes, and on April 28th, we will have a 10% discount again because of International Tabletop Day.